In 2016, the Jesuits, with the blessing of Pope Francis, installed as its general superior a Venezuelan, Fr. Arturo Sosa Abascal, whose communist convictions have long been known. It shouldn't come as a big surprise, therefore, that a Jesuit who is a Marxist should deny the inspiration or inerrancy of the Bible, or the existence of Satan as a fallen angel. Francis, himself a Jesuit, has curiously emphasized again and again that the devil is real. On this specific point, he is actually orthodox, and you can bet your bottom dollar that the likes of Tim Staples, Patrick Madrid, Michael Voris, Tim Haines, and Jimmy Akin will not fail to use the "Supreme Pontiff" Francis to refute Mr. Sosa. However, what you will definitely not find is Francis removing or otherwise disciplining Sosa. Our prediction is that Francis will remain silent and do nothing. In case someone should ask him about it in an interview and he is forced to address the matter, he will probably contradict Sosa, but he will not condemn him. Thus will the ancient Modernist strategy come to fruition once again: free reign given to people like Arturo Sosa so they can continue to spread doubt and confusion in the minds of the faithful about the truth of Catholic teaching ("you don't have to believe in the devil! "), while retaining some plausible deniability ("the Pope said the devil is real!"). This strategy is diabolical, but it has been used successfully by the Modernists for decades because of many willing henchmen and useful idiots who go along with it. Between Francis, Sosa, and "Fr." Antonio Spadaro, there seems to be a virtual competition going on about which Jesuit can do the greatest damage to what is left of the virtue of faith in people's souls. The abbreviation "S.J." used to stand for "Society of Jesus", founded hundreds of years ago by the glorious St. Ignatius of Loyola. The Jesuits have had some of the Church's greatest theologians among them, such as Cardinal St. Robert Bellarmine, Cardinal Francisco de Lugo, and Fr. Francisco Suarez. At this point, however, the Jesuits are nothing but a cesspool of Modernist apostasy. They can retain their letter symbol "S.J." if they like, but it comes now with a new signification to reflect the changed theology: Without a doubt, it is now the Society of Judas. 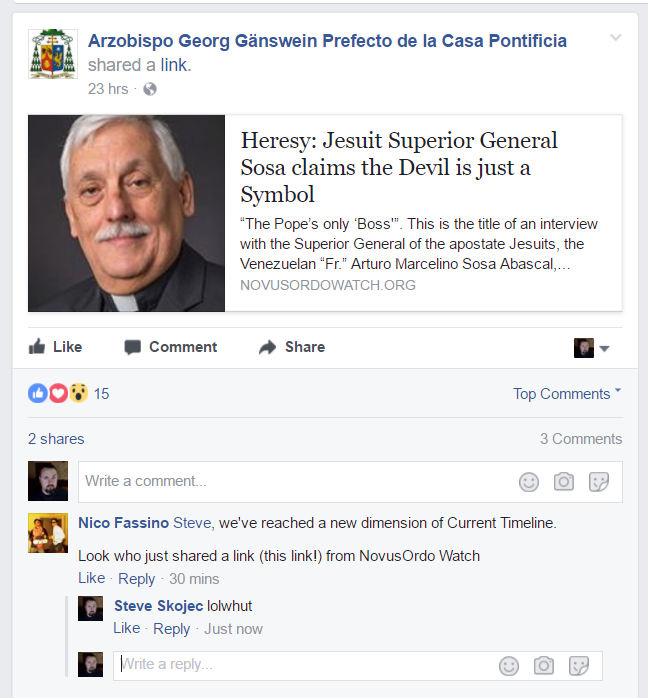 In a defense that was as predictable as it is unoriginal, a spokesman for the Superior General of the Jesuits, “Fr.” Arturo Sosa, has claimed that the chief Jesuit’s recent comments denying the existence of Satan as a real fallen angel have been — just guess! — taken out of context. A spokesman for the Jesuit superior general has said his comments on the Devil must be read in context. A spokesman for Fr Sosa told the Catholic Herald that the phrase “We have formed” should not be taken out of context. [Interviewer:] Para terminar quería preguntarle si cree que el mal es un proceso de la psicología humana o proviene de una entidad superior.